Hope everyone had a great weekend! If you were running races, I hope you had a great time and finished in the way's you had hoped!!! Today is a Blog Link-Up you'll find the link up below. I am now 2 1/2 weeks into my 8 weeks of wearing a huge boot to help heal this injury. The swelling hasn't gone down much, but on a good note its become slightly less annoying than it was at first. Since I have to wear it at night, I've finally gotten used to sleeping with my foot elevated, so I consider that success! 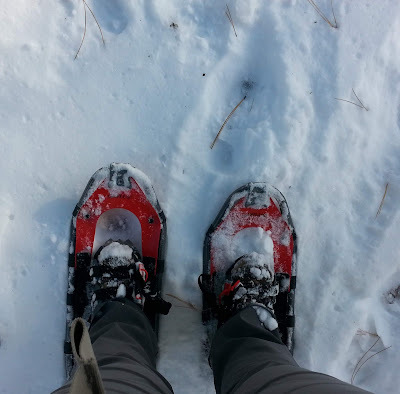 I've struggled with how to incorporate fitness into my life now that I am in the boot. Many may disagree with my answer, but I have decided there isn't really a way to do it. I'm not supposed to be walking much, and absolutely no running or jumping or activities on my feet. So what have I been up too? 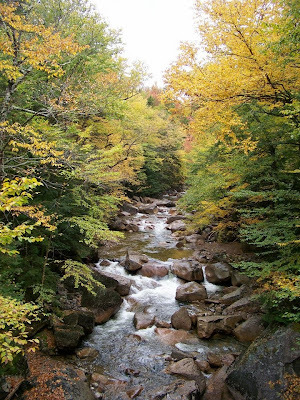 Well fall is my absolutely most favorite time of the year to be up camping! The weekend or one time a year campers aren't up there, the people who come up to play loud music aren't there. Its just hunters, and mostly people who just love the outdoors. So I was camping up a week ago, loving the cooler temperatures and the peaceful outdoors. 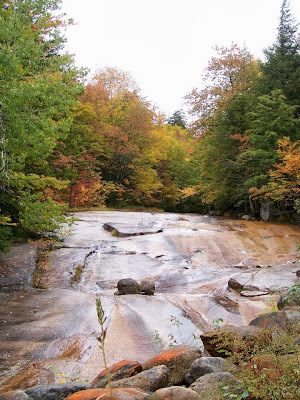 We received quite the set of storms this past weekend, so the colder temperatures and the snow that pretty much dropped all over the place even the lower elevations around 5,000 feet received snow, so this should bring on our fall foliage this week! Which is why, I am going to be taking off again and heading up into the mountains again this week. 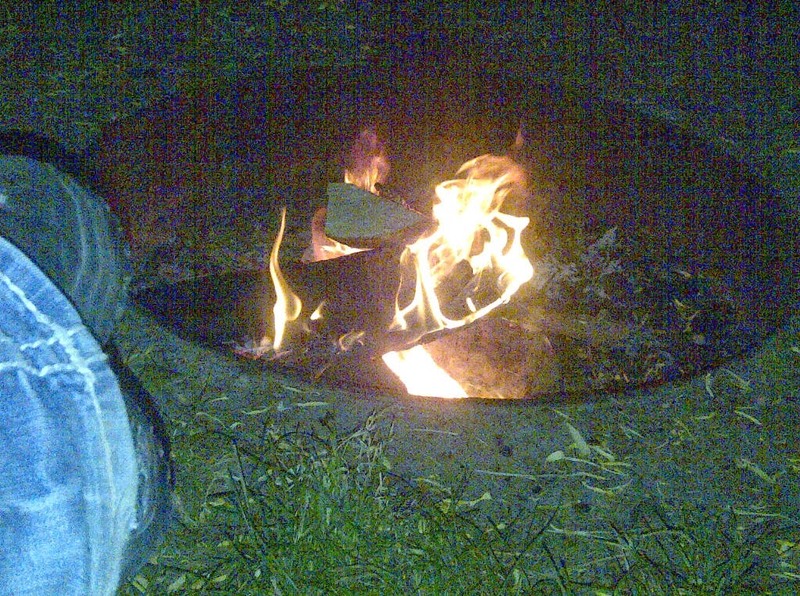 The other great thing about fall camping are the campfires, they feel soo much better when it's chilly outside! So what fun things have you been up to lately? Do you enjoy camping in the fall? Anyone have some fall race posts they'd like to share? 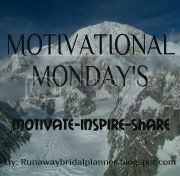 Today is also a BLOG LINK-UP, so if you have a post you'd like to share, I'd love it if you'd link up! If you join the link up, try and visit another blog as well. This week I'd like to introduce Caroline. I asked Caroline several questions, to tell part of her story and introduce you all to her. For just "everyday" runs, I like to run somewhere between three and four miles. For races, I seem to enjoy the half marathon the best! Saw that you just started running a few years ago, tell us what got you into it. 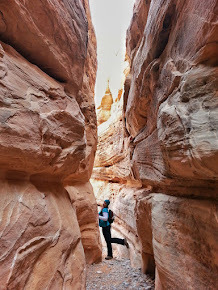 I actually wrote a post on why I started to run a few months ago Here: http://fightingforwellness.wordpress.com/2013/04/24/my-journey-to-running-part-2/ )- to make a long story short, I had a dream that I was running and I loved how it felt in the dream, so I decided to try it! Funny reason to start running, isn't it? I hadn't run in years because I have Postural Orthostatic Tachycardia Syndrome, and running is very difficult with POTS. I have to take extra precautions, but now I run, in part, because it's something that I thought I might not ever be able to do again because of my medical condition. You've done Triathlons, tell us what is your favorite part of them. What I love the most about triathlons is the variety and the extra challenge. I love that I get to cross train every week as part of my training, and instead of one thing to prepare for, I have three events (plus two transitions) for which to plan and prepare. 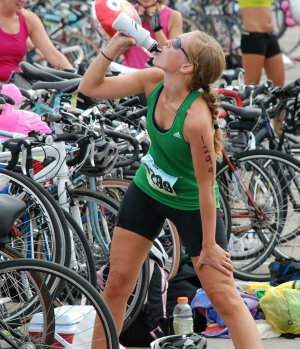 There's something extra tough feeling about doing triathlons too... even sprint triathlons! My favorite race was the Monumental Half Marathon I ran in November of 2013 (recap here: http://fightingforwellness.wordpress.com/2012/11/04/indianapolis-monumental-half-marathon-recap/). It was my second half marathon, and I set a massive PR! I'm about to start training for that race again! There's a half marathon that ends in Athens, Greece, and I think it would be absolutely epic to run there with all the history (human and running!) and amazing views. I've traveled to Greece a few times and it's also one of my favorite places on earth! Per your blog, you love to travel. Tell us about some of your favorite travel spots. Do you do race traveling? I guess I answered that a bit in the question above. I do love to travel. I find different cultures, food, history, and people really interesting. My favorite place that I've been overseas has been Greece. I studied there my sophomore year of college, and also had the opportunity to give a lecture series there a few years ago! I'm lucky in that I get the chance to travel for work, so I've gotten to see a lot of places because of that. I really love New York City and Marco Island, Florida! I also love Minnesota in the summer because it's absolutely gorgeous! I've actually never done a race while on vacation, but I'd love to mix the two. Your a Pilate's Instructor, do you find Pilate's is a great component to add to a runners life? I find that pilates is crucial to my life as a runner and biker! (I wrote an entire post on "why pilates?" here: http://fightingforwellness.wordpress.com/2013/05/29/why-pilates/ ) With running, it's critical to have a strong core (our body's "powerhouse") that helps keep all of our muscles engaged. Pilates also helps strengthen some of our weaker muscles, which helps to keep us balanced. As runners we tend to use more heavily certain muscles, and as others get weaker, we're more likely to get injured. Pilates also helps stretch out those stiff muscles and keep me flexible- also critical to help avoid injury!! Your a mental health councilor, do you love your job? Just curious, do you promote running to your clients as a way of stress relief? I absolutely love my job! Actually, I hardly even think of it as a job, and sometimes even feel guilty for getting paid for something I enjoy so much! I feel lucky almost every day I leave work that I have the opportunity to walk alongside others as they try to reach a healthier place in life. I don't try to push running, but I do encourage exercise of some kind in most cases. Obviously with some things it's better to take a break from most types of exercise, but because our mental and physical health is so incredibly inter-connected, we need both to be healthy! I've found for myself that running definitely has helped my mental health, and I will share that with clients if they ask. Many clients also know that I run races, and they love to follow along in training and hear about my races. Sometimes I even see some of them on the course as they're running too! You've been going through some injuries, tell us things you have learned about them, and what good advice do you have for others who have to battle through injuries? Crossing the finish line of my last half marathon felt like nothing but frustration and pain (that's where my tendinitis first flared up), but normally crossing the finish line feels like I'm on top of the world (even though I'm a slow runner!). Like I said, I have a huge medical condition to conquer in terms of running, so when I cross the finish line I'm flooded with gratitude and excitement. It's a feeling unlike any other- even when I passed my thesis defense in grad school! See #4! I'm also really proud of my first half marathon. My time was slow, but running 13.1 miles was something that I truly never thought was possible for me. From mile 12 on I was choking back tears, and when I crossed the finish line I burst out into very happy tears! I'm really struggling to think of something really funny... in my last half marathon in May, I was struggling with really bad leg cramps and tendinitis, and those last miles were really painful. At mile 10 I stopped to stretch on the side of the road, and one runner ran over to me and offered to carry me to the finish line! I told him I'd crawl if I had to but thanked him anyways. I kept imaging my parents faces as I was piggy-backed over the finish line. Because I can and I never thought I could. Also- I run to prove how strong I really am, and that medical conditions don't have to define our lives, even if they make things much more challenging. On shorter runs I listen to music, but when I do my long training runs, I tend to listen to podcasts (I especially like the NYRR and Jillian Michael's podcasts). For running, I love songs by Pink or anything with a good beat/a happy memory associated with it. Yes! Most of my days are actually cross training to help me avoid injury. Obviously because of triathlons I like to swim and bike, but I also try to lift, do pilates, and I really love to go on walks as well. I really enjoy spending time with family and friends, traveling, reading, and cooking. I do spend lots of hours every week catching up with important people in my life. Good question- I'm motivated by the past and the future (the past either through how past generates have pushed themselves to achieve and by successes I've experienced in the past), and by thinking about how what I'm doing now might impact my future, or even generations after me. Knowing that I took my gifts and used them well is meaningful and continues to push me. My phone and compression sleeves! No matter what else I'm wearing or where I am running, those always come with me (unless it's a triathlon!). One of the most critical things that I've learned through running is comfort in the present vs. comfort long term. In life if we choose short term comfort, we often don't achieve these great dreams we have for ourselves. For running, it's all about that long term comfort or success- we strength train, foam roll, take those freezing ice baths, and spend hours logging miles so that we can arrive at the start and finish line of a race in a healthy manner. Health isn't the easy choice usually, and running has certainly taught me that. It's a valuable lesson that carries over into most areas of life. Pre run I usually have a Luna Bar, oatmeal, or banana, and orange juice. Post run it depends on what time of day. I crave chips and salsa so much after runs! If it's after a race, I go straight for a foot long sub! I'm also always game for a cupcake! Most of my race t-shirts I wear, although the few that fit oddly I just keep in a draw and smile when I see them. My medals are on my TV stand right now. I definitely need to get a medal hanger though. This year I've been trying to really focus on enjoying the moment that I'm in instead of always longing for something in the future. I want to enjoy all the little things that happen in the moment, like enjoying a sunset, the songs of the birds in the tree outside my kitchen, the taste of hot chocolate on a cold night, or the laughter of my friends. I'm working on not taking all the little things for granted. Okay, some of you may know I am a HUGE Jane Eyre fan!!! It's not only a Bronte Classic, but one of my favorite books! 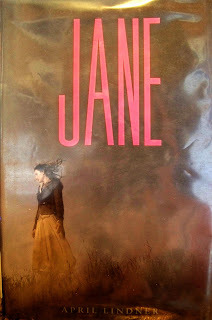 How I missed discovering this little gem of a book until now is beyond me, because Jane by April Linder is an absolutely fabulous modern version of Jane Eyre. Romance fans and Jane Eyre fans, let me say you seriously won't be able to put this book down. The author captivates your attention using her own well written original version of the classic love story. Jane Moore is a homely girl, who grew up with parents and siblings who mainly treated her as the outcast of the family. When she is forced to drop out of college after the death of her parents and find a job. Jane decides to sign up with a nanny agency. 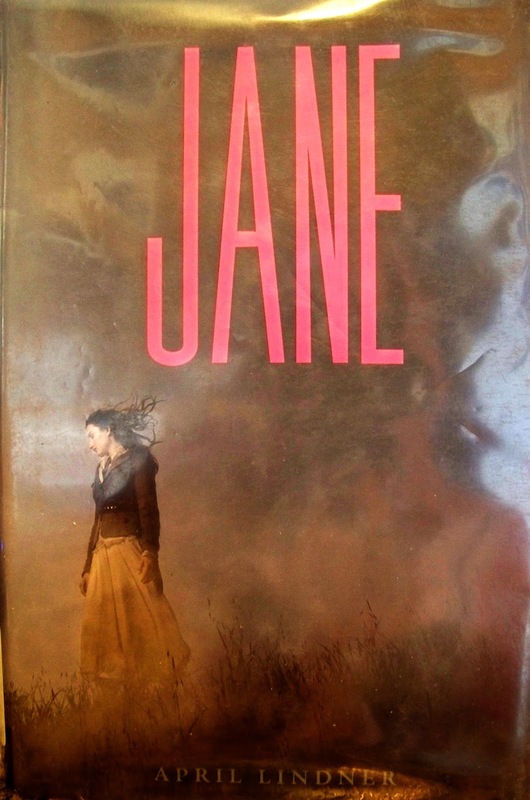 Because Jane is so plain, the agency finds her perfect for the nanny position at the Thornfield Park estate, also home to the world-famous rock star Nico Rathburn. Nico, a bit older has had a rockstar life which included lots of money, drugs and romances. Many romances in fact, one of which resulted in a daughter. He's never had to hold back from anything, he's had everything he ever wanted and more and now he's about to launch a massive comeback tour. Now for any of you Jane Eyre fans you pretty much know what happens next. Thornfield is filled with secrets, and a budding romance between Jane and Nico. But Linder does this in a way, that you still feel the classic shine through, but a new version with differences that keep the reader turning pages and wanting more and more. What you can expect with this book, is a retelling of a favorite classic. But unlike the original, you don't have to start with her childhood and life before she meets the famous Nico. Instead you as a reader get to jump right into Jane's move to Thornfield and watch the romance and story unfold from the beginning of the book. It's also considerably more fast paced than the original. However, don't worry you will still have plenty of character building for Jane and still gain the understanding of her pre-Thornfiled life. You'll find yourself wanting, and smiling and being totally in love with this absolutely irresistible romance between Jane and Nico. I recommend this book to anyone who loves the original Bronte Classic, as well as any reader who enjoys throwing them self into a fabulous romance. The only downside to this book was the language, I don't particularly like reading books that drop the "F" bomb often throughout. This one does quite a bit, with the Nico character. I understand why the writer did it, she likely felt that is how a rockstar would talk and she helped use the language to build the character of who he is. Personally I think she could have established this without it, but that is just me. So if that sort of thing bothers you, you may not enjoy this read as much. If you are like me, don't particularly like bad language in a book, but you read instead of listen to a book, you can do as I did and just skim over those parts and not let it ruin the rest of the fabulously romantic story! Disclaimer: I was not asked to review this book. All thoughts, opinions and pictures above are my own. 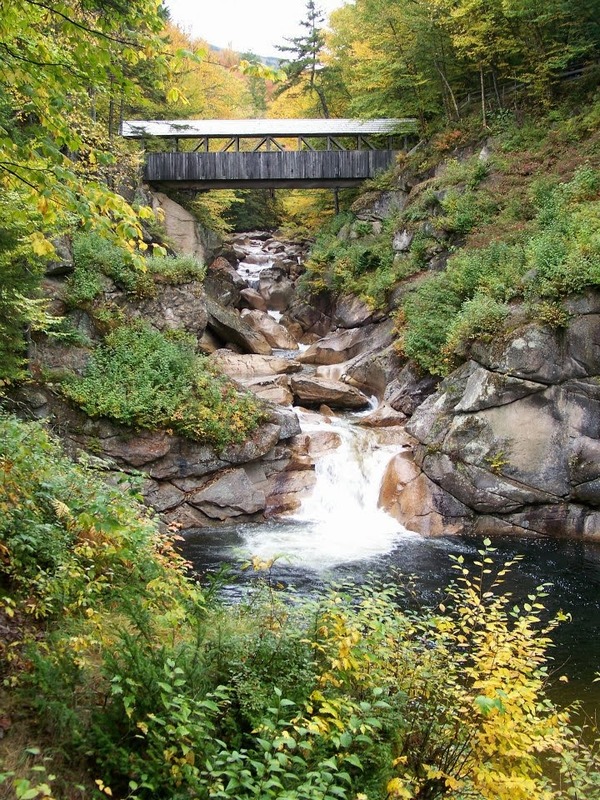 Today for my Travel Tuesday post I am taking you on a hike in Franconia Notch State Park in New Hampshire. 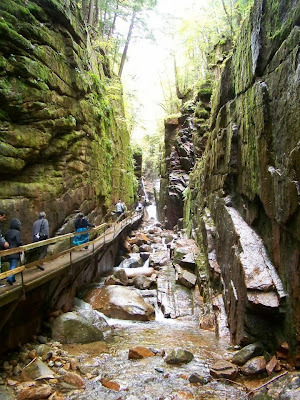 This is the Flume Gorge Trail. 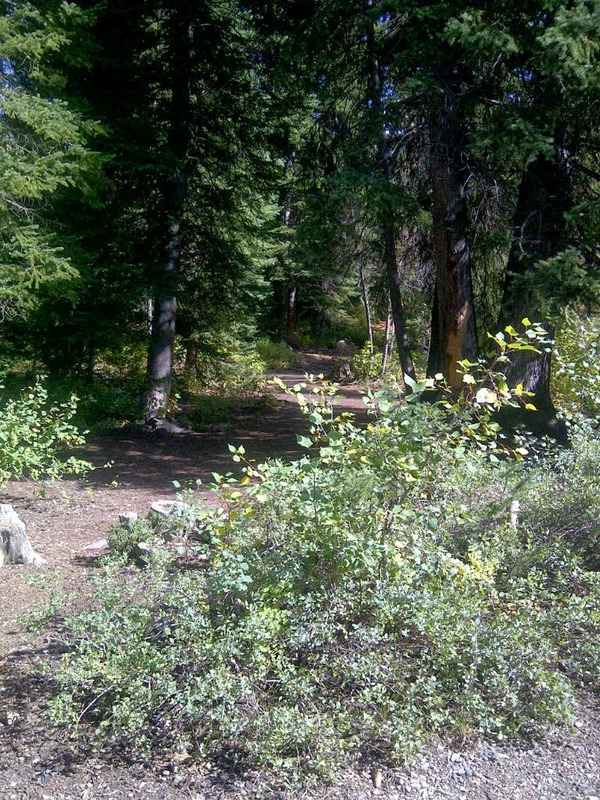 This is a nice and easy 2 mile hike that anyone can do. 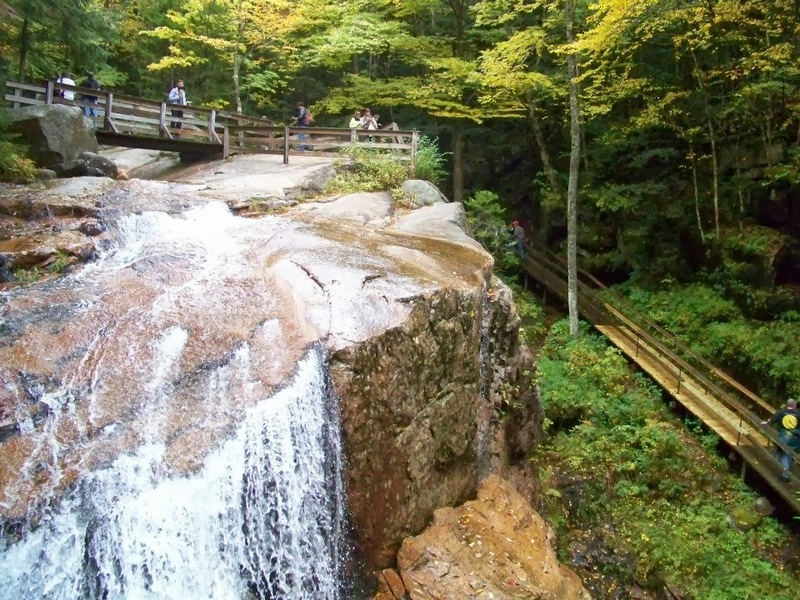 However, if you have a fear of heights, it might not be something for you. But if your fears not too bad, go for it, its worth it. 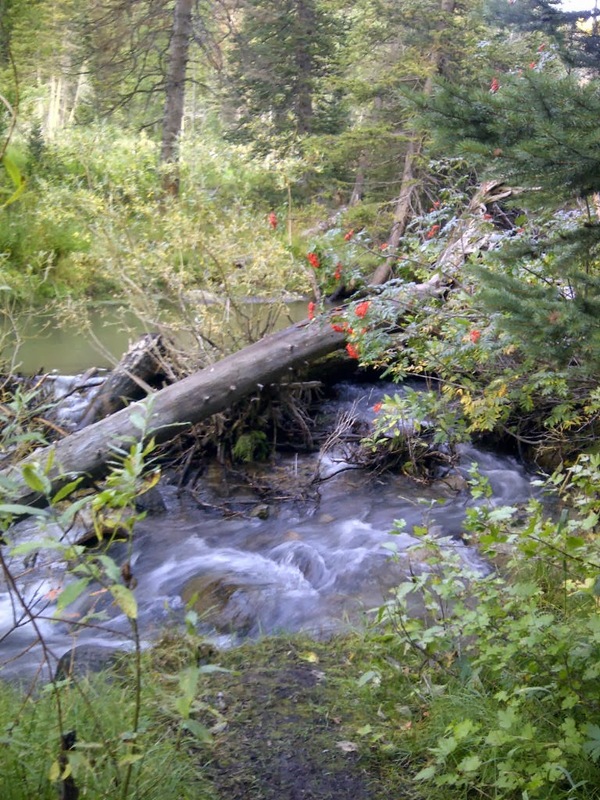 I took this hike in September, which is why the leaves are just starting to change. This is my favorite time of year in New England, as things are still green but some areas are just starting to sprout those beautiful and brilliant fall colors. I should note, for those who cannot walk 2 miles there is a shuttle bus that can take you most of the way up to the gorge. 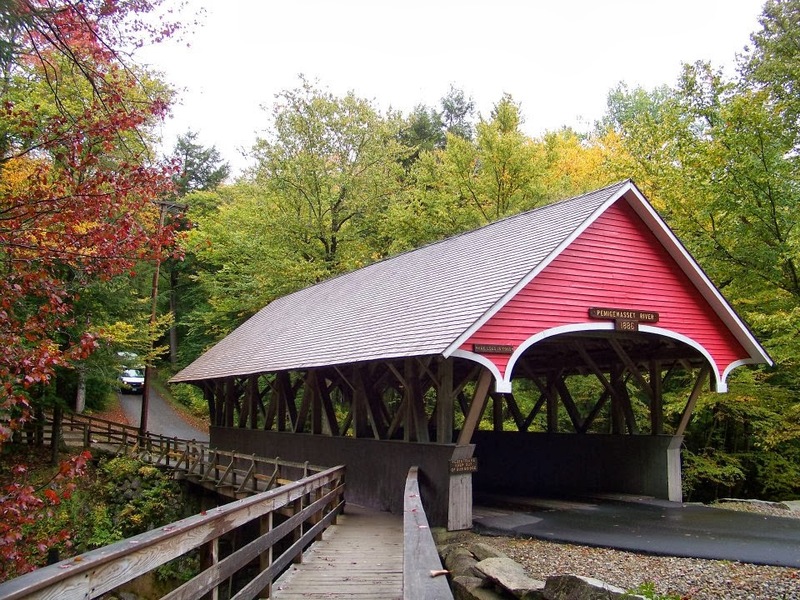 First off, you'll get to walk next to this cute covered bridge, I love covered bridges! 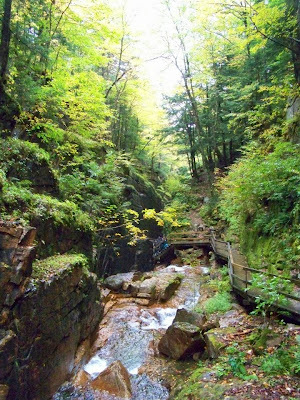 The trail takes you along the river that comes from the Flume Gorge above. Beautiful granite rocks stand out as the water runs down them. You'll begin walking up the gorge, on these wooden bridges built right into the granite rocks. 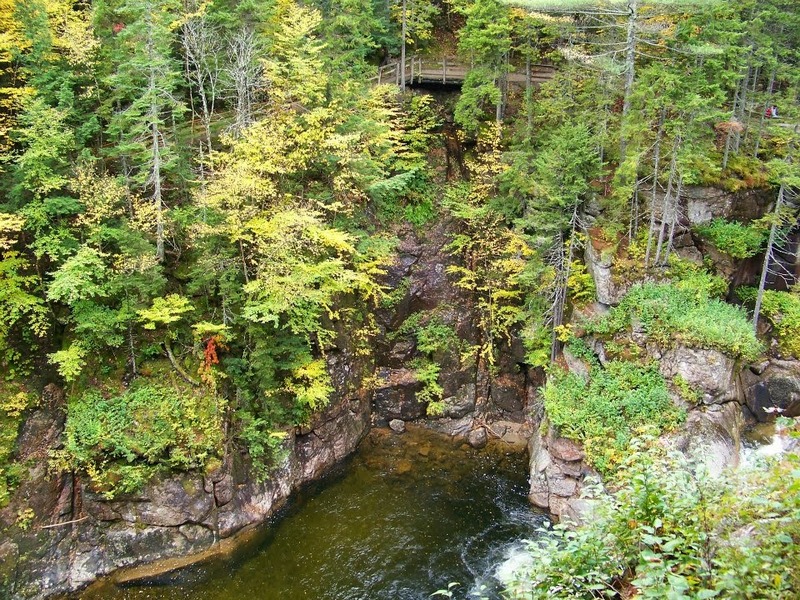 The rocks shoot up 70- 90 feet above you. Covered in moss, it is absolutely beautiful. 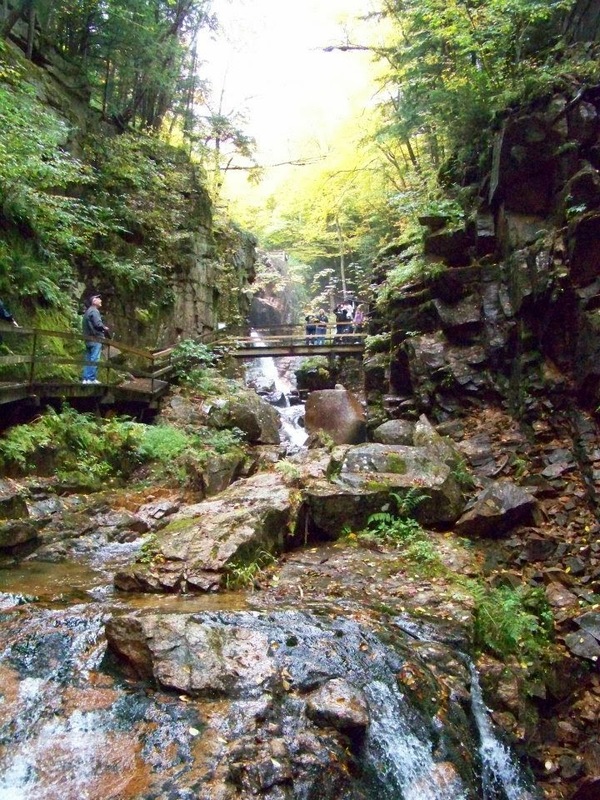 There are quite a few stairs as you climb your way up the gorge. 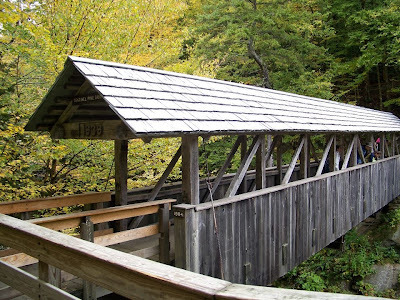 There are bridges that cut across back and forth, so you have lots of opportunities to break out your camera. If your lucky, you'll hit it on a day that it is less crowded so you can just stop and enjoy the beautiful peaceful surroundings. You'll have lots of picture views, both above and below the gorge. Make sure you take all the little side trails, they lead to some spectacular views! This picture above, is one of my favorites that I took that day! 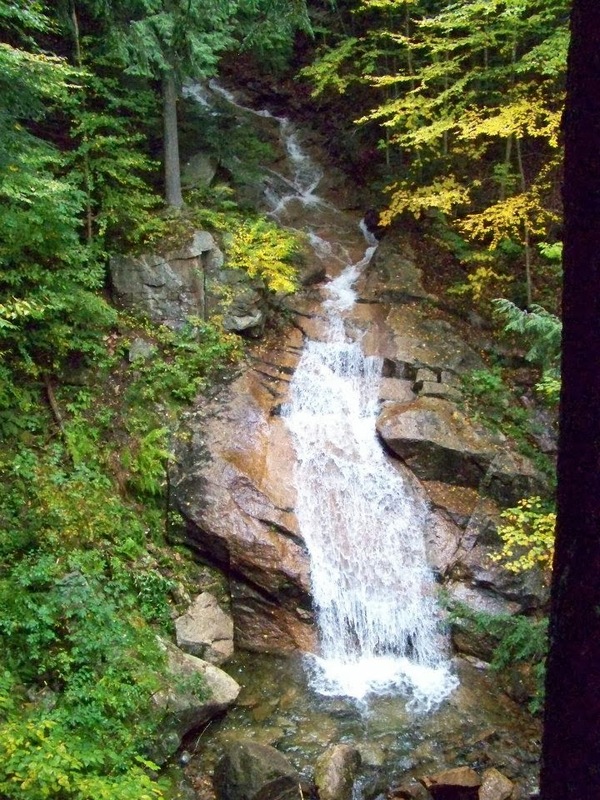 * It does cost to go on this hike. When I went it was $15 for each adult. * This is a seasonal place, check with their website to make sure they are open. 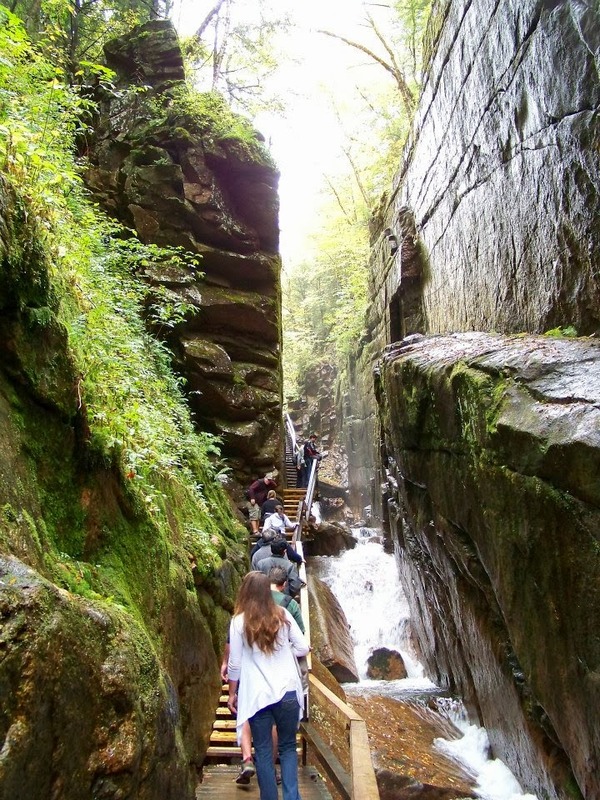 * The hike is in Franconia Notch State Park, so there is plenty more to do and see if you visit the area! First I want to give an awesome shout out to my sister. 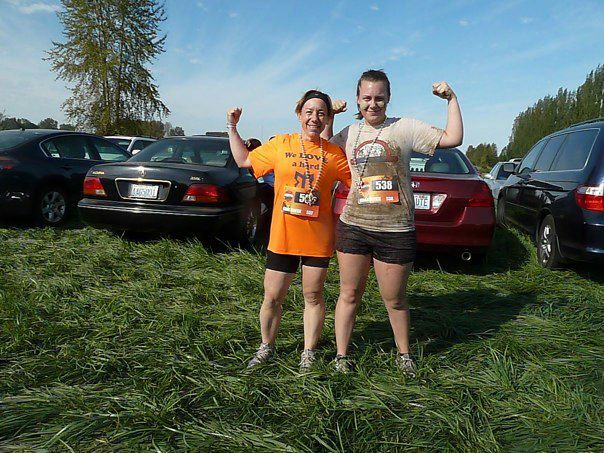 Earlier this year she swore she'd never run a marathon. But I guess anyone can change there mind, and that she did. A couple of months ago, she bumped up her training and entered her first marathon, which she ran over the weekend. Not only did she finish, but she finished with an incredible time of 3:40, in that fabulously hilly Top of Utah Marathon! Congrats Sis!!! 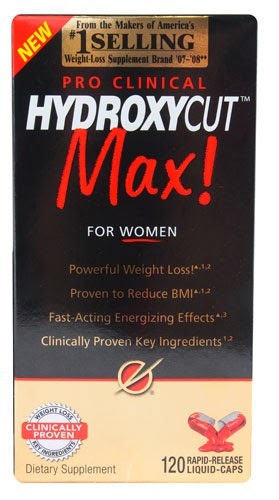 Also today, I have a fun giveaway offer, for someone who would like to try out Hydroxycut Max for Women. A powerful weight loss supplement, courtesy of Vitacost. I have a few fun giveaway offers today. This is a TWEET to WIN. Winner will be announced and contacted on Friday. Giveaway is for Hydroxycut Max for Women. * The selected winner will need to provide an address and your prize will be mailed to you directly from Vitacost. * You can enter as many times as you want to Tweet it out. My Review on ORAL I.V. 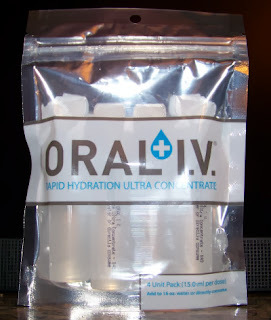 I received an amazing opportunity to test out and review Oral I.V. In case your wondering what Oral I.V. is, like I did before I tested it out. This is an amazingly different Hydration Recovery Product, that can also be used to help prevent Dehydration during a workout. If you are anything like me, you are probably wondering how it tastes. To be honest, when I received it I was expecting it to taste salty to some extent. However, I couldn't of been more wrong! It actually tastes just like water. I actually tested this out back in August, and a few times since then. 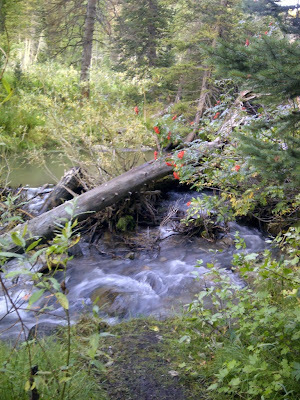 In August I was still able to run a bit and I was doing a lot of hiking. One day that I was going hiking, I decided to take one of the capsule's with me and try it out. I popped the top off, and couldn't resist taking a little taste, just to see how it was. It tasted exactly like water, no after taste or anything. The directions say you can either take it alone, or with 16oz. 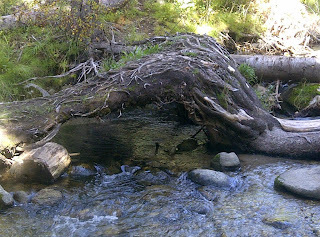 of water. So I threw a water bottle in with my other water hydration pack just for this purpose. I took a couple of sips from the bottle to make room for the Oral I.V. and then poured it in and shook it up. I decided to drink the water with the Oral I.V. first that day. It was a hot day, and we hiked several miles and did a lot of climbing. I won't say I noticed any major differences, but will say that even after a hot day I did not go to bed that night feeling any symptoms of dehydration from spending all day hiking around in the 95 degree temps! A few weeks later I noticed I was experiencing some bad headaches, and it seemed like no amount of Tylenol or Excedrin Migraine were helping them. For days I had a lingering headache that would get worse as the day wore on. A family member asked me if I was dehydrated. It was then it occurred to me that I very likely could be. It wasn't that I wasn't drinking water, but I really hadn't been drinking much each day. We had been having several weeks of 90-100+ degree temps. So a little dehydration made sense. I remembered I had the Oral I.V. and thought this would be a unique way to test it out. It was morning, and I had woken up with the same bad headache that I had been having for days. So poured an Oral I.V. into a 16oz. bottle of water and drank it as I got ready that morning. A few things to note, I did NOT take any pills for the headache, I only took the water with the Oral I.V. I can honestly say that my headache was near non-existent about 45 minutes after I finished the drink. I didn't think I needed another Oral I.V. since it would already be in my system, so I just drank water normally through the rest of the day. The remaining headache eventually left me entirely a few hours later, and did not return. Based on my previous days experience with the pills not working, and then taking the Oral I.V. I am pretty confident in assuming that the Oral I.V. helped rehydrate me faster than just drinking water alone! Here is some pretty cool information about Oral I.V. What is it? 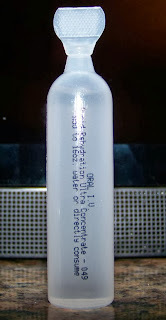 It's a Hydration Aid - It is used to assist in hydration, not to be used solely as a hydration source. Why DOESN't it have a bad taste? It doesn't have Sugars, Caffeine, Stimulants or any additives, artificial ingredients. So whats in it? It's a formula of Crystaloid electrolytes and purified water. Why/When should I use it? * Use it to aid in Marathon Training, Cycling, Hiking, Climbing, Professional Sports or other Strenuous physical activity or even in your daily life, like on the job. * It's small, can easily fit in a pocket or sports pack to carry with you. * Contains no sugars or stimulants. * Shorter your recovery times from exercise and exertion. Want to learn more about Oral I.V? 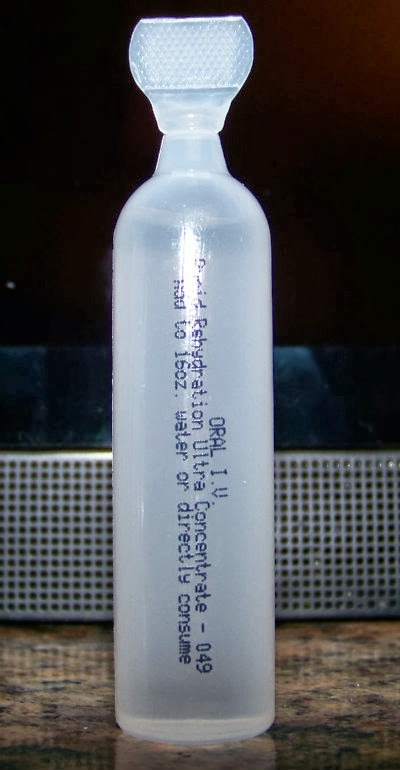 Disclaimer: Oral I.V. Provided me with free samples to try for my opinion and honest review of this product. I was not required to write a positive review, all thoughts and opinions are my own. This week I'd like to introduce Bethany. I asked Bethany several questions, to tell part of her story and introduce you all to her. The Half Marathon is my favorite distance. 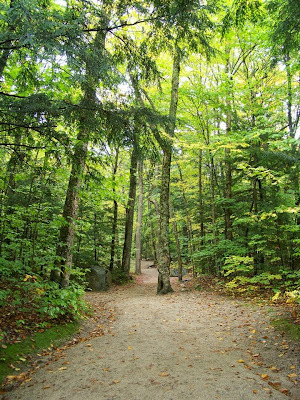 It is enough of a challenge, but not as difficult as marathon training. I started running about 4 years ago. What made you want to become a runner? I started running to lose weight and get healthy. I keep running because I love it and it allows me to eat many of the foods I enjoy. 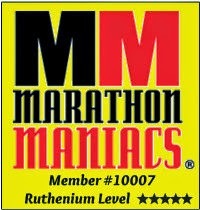 I have run 2 marathons 26.2 miles. I’m training for the Portland OR and NYC marathons. What has been your favorite race and distance you have run? 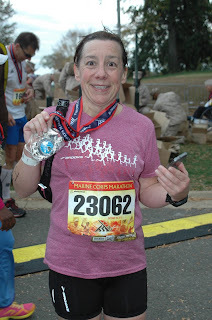 One of my favorite races was the Marine Corps Marathon in DC. I had moved to Seattle 2 months before and it was the first time to see my family, since moving and being diagnosed with breast cancer. The race was my last hurrah before starting chemo and radiation. I enjoyed the whole weekend, even being stuck in DC for 2 extra days because of hurricane Sandy. This race has crowd support the entire course and many people running in memory of fallen service men. You run by all the major monuments, it is amazing. The Boston Marathon, no question. It is home. I run for fun and to compete. I always have a race on the calendar. I won a third place in my age group at the Vitality 10k in February 2013, it was a very small race. Tell us how you battled through cancer, and won. Was running a part of this? Or was it something that you decided you wanted to do to overcome the cancer? I moved to Seattle last August from Boston, where I have lived all of my 47 years. I was training for my second marathon, Marine Corps. One week after arriving in Seattle, even before my moving truck had arrived from Boston, I was diagnosed with stage 1B breast cancer. My mother had died of breast cancer 13 years earlier so telling my 2 girls, father and siblings was very difficult. They all wanted me to pull out of the marathon; it may be too much on my body. I didn't. I continued training and due to 2 surgeries missed a few runs, but on October 28 I was at the start line and finished with a 6 minute PR. Three days later I started 3 months chemotherapy, then 6 weeks of radiation. Through it all I ran, slower and less but I ran. I was not going to let cancer beat me. Running was time to think and figure out how I was going to get through all of this. I gave me peace and strength. If cancer taught me anything it was to take chances in life. Life is too short to second guess yourself or be afraid. We all have had challenges in our lives. It is how we handle them that can made us better people. What does crossing the finish line feel like to you? There is no better feeling than knowing you gave it your all on the course. It is a huge sense of accomplishment. I just recently had a PR at the Tacoma Narrows Half, by almost 2 minutes. I’m very proud that post cancer I’m running so well. Have you ever ran a race in costume? Yes, I ran a Santa run were your registration fee included a Santa suit, complete with beard. I run to eat. I also run for the sense of accomplishment it gives me. Yes, I’m in it for the long haul. What states have you run races in? Tell us the state and the race distance(s). No, but I would love to run the London Marathon. Short runs by myself, but I love company on long runs. Yes I listen to music. My top two songs currently are Fall Out Boy Young Volcanos and Fun All the Pretty Girls. I use bike trainer about once a week, and walk my dog about 2 miles every day. I love to bake. My daughter and I bake something weekly. I love the high I getting a PR. Trying to do better that you have in the past is a big motivator for me. Get fitted for running shoes at a running store. Start slow, maybe with a run/walk plan or Couch to 5k. My Garmin 210. I love analyzing the data. Patience. It takes years to become a good runner. Pre toast with PB. Post pancakes. What do you do with your race t-shirts and medals? Do you wear them proud or display them for all your guests to see? When we moved I did not hang my medals. I do have a few new ones hanging in my closet. Some shirts I wear, if they fit. Most of them I give to my daughter. Bethany thank you so much for letting me spotlight you! I love your spirit, and your will! I loved that you looked cancer in the eye and told it, it wasn't going to get you and you ran a Marathon despite the odds! They say attitude is everything with cancer and getting through it, and you proved that correct! Not only that but you got a PR on your Marathon time.. Incredible!! Congrats on your 3rd place finish earlier this year! I can see you are a determined woman, and will accomplish many great things! Look forward to following your running journey! !